BETHLEHEM, Conn. - In the little town of Bethlehem, a cloistered nun whose luminous blue eyes entranced Elvis Presley in his first on-screen movie kiss is praying for a Christmas miracle. Dolores Hart, who walked away from Hollywood stardom in 1963 to become a nun in rural Bethlehem, Conn., now finds herself back in the spotlight. But this time it's all about serving the King of Kings, not smooching the King of Rock and Roll. The former brass factory that houses Mother Dolores and about 40 other nuns cloistered at the Abbey of Regina Laudis needs millions of dollars in renovations to meet fire and safety codes, add an elevator and make handicap accessibility upgrades. Like 73-year-old Mother Dolores, the order's nuns have taken a vow of stability with the intent to live, work and die at the complex. The order was established in 1947 in Bethlehem, a small burg in Connecticut's rolling western hills. Now, the historically self-supporting nuns have launched a fundraiser for the $4 million renovation project dubbed "New Horizons." They don't have much money, but they have Mother Dolores: a starlet-turned-supplicant whose unique story might lure the attention and donations of generations of movie fans, particularly those who adore all things Elvis. "This work may not be in my lifetime that it's finished, but we're sure trying," Mother Dolores said of the upgrades, which are budgeted to run about $2 million for the fire code and accessibility compliance work and another $2 million for improvements to the housing and other facilities. They hope to break ground in January. They're not in imminent danger of needing to move out, but many of the older nuns can no longer navigate the narrow steps to the main building's third floor and must live in another building. And without adequate fire escapes, the monastery has caught the eye of local inspectors, though they've worked closely with the nuns on the improvement plans and haven't ordered them to close the building. 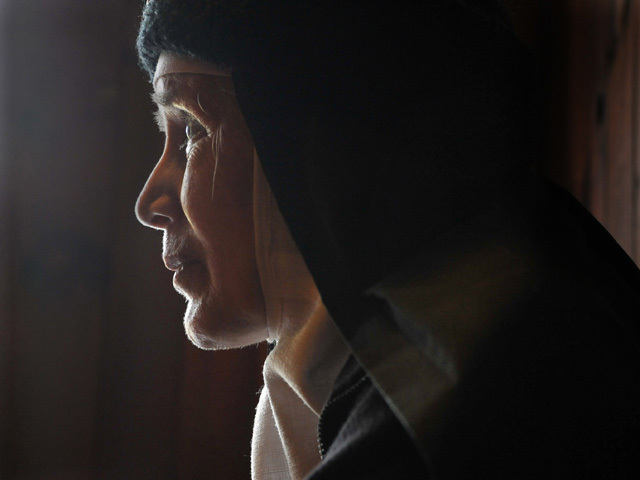 For Mother Dolores, the monastery has been home since she was a 24-year-old actress in 1963 and walked away from Hollywood for a life of contemplation and prayer as a postulant. The abbey's chapel, workshops, livestock pastures and other features are part of her soul now, and its wood-paneled monastery is the only home she's known for 50 years. Its theater holds a special place in her heart, harkening to the former career that landed her on talk shows, in magazines and twice as Elvis Presley's co-star. Dolores Hart was a vivacious, quick-witted blond starlet when she charmed Hollywood in the 1950s and early 1960s. She shared a kiss with Presley in the 1957 Paramount film, "Loving You"  a modest liplock over which Mother Dolores still fields frequent questions about whether the King was a good kisser. "I don't know why they ask me. It's right there on the screen to see; it's right there for the looking," she said Thursday. Hart acted in 10 movies alongside stars including Montgomery Clift, Myrna Loy, Connie Francis and Anthony Quinn. She said she was engaged to be married before joining God's service and leaving the acting world behind. She broke off her engagement, though her fiance remained a close friend and was a frequent visitor and supporter of the abbey until his recent death. The nuns also received support and help over the years from Mother Dolores' longtime friend and fellow actress Patricia Neal, who was buried at the abbey after her death in August 2010. Mother Dolores is still a voting member of the Academy of Motion Picture Arts and Sciences, receiving copies of movies to watch in her small room  or cell, as they're known in the order  to help select yearly Oscar winners. Her own movies, including the highly popular "Where the Boys Are," were made before stars routinely could negotiate to collect later royalties, she said, so that's not a potential source of income for the upgrades to the abbey. The abbey is financially independent from the Archdiocese of Hartford and supports itself through the sale of everything from artisan cheeses and hand-crafted pottery to recordings of its choir. Mother Dolores even recently signed autographs at a New Jersey convention, a rare foray out of cloistered life as a favor for a friend, and one that helped boost the fundraising efforts. Sister Angele Arbib, a coordinator of the New Horizons renovation and fundraising efforts, said the order is applying for grants and the nuns are trying to spread the word among the abbey's supporters, but are not disclosing publicly how much they've raised so far. Unlike some orders, the Abbey of Regina Laudis has retained a steady number of nuns and new postulants, including two starting in the next few weeks  but that can't continue if the housing and other facilities keep eroding with age. "We have focused on building our community, which has been wonderful, but now it's time that we really have to address our space," said Sister Angele, 63, who left a thriving career of managing opera singers when she was 50 to join the order. "None of this, not one single thing we're doing, is an extravagance," she said of the upgrades. "It's to make it possible for us to grow, for the elderly among us to live with as much independence as possible and to allow us to live together in surroundings that let us continue our service." Sister Angele said the nuns are not in any imminent danger of needing to move out, though she acknowledges they'd be in dire straits if they had not anticipated the problems early enough to prepare the upgrade plans and launch the fundraising efforts. As word has spread of their needs, supporters of the nuns and those who've visited the abbey, prayed in its chapel and picked up items in its gift shop have tried to help in ways of their own. Liz Carpenter, a Watertown resident who owns the Children's Dance Workshop, said its children have raised $600 to help through a raffle. She's been a grateful supporter since the nuns helped her through a cancer battle about 10 years ago and now volunteers to clean the church once a week. "I wanted to teach the kids that it's important to give back," she said of their fundraiser, "especially for a place that does as many wonderful things as this one does."